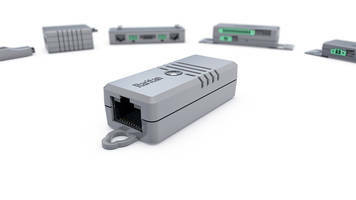 Somerset, N.J., Jan. 22, 2019 /PRNewswire/ -- Raritan® — a brand of Legrand®, and a leading provider of intelligent data center management and rack power distribution solutions — today introduced new monitoring sensors to provide data center operators an accurate picture of environments at the rack, aisle, and facility level, and of potential risks. Raritan's new SmartSensors™ can monitor a cabinet's temperature, humidity, airflow, and air pressure -- as well as detect water leaks, vibrations, and unauthorized openings of cabinet doors. With compute loads and deployments of double-digit kW cabinets on the rise, accurate monitoring of environmental dynamics is necessary to provide safe conditions for servers to operate. Raritan'snext-generation environmental sensors provide the industry's highest metering accuracy at +/- 0.5 °C for temperature sensors and +/-2.5% for relative humidity sensors. "By using Raritan's SmartSensors, data center managers can accurately monitor the exact input and output temperature, humidity, and airflow for every single cabinet in order to fine-tune cooling and humidity requirements and to optimize efficiency," says Paul Mott, Global Technical Product Manager at Raritan. "Generating data at the cabinet level allows for better analysis and opportunity to optimize operations and reduce energy costs." SmartSensors come in different configurations – such as a combined temperature and humidity sensor – to make it easy to measure the cold and hot aisles, and position the sensors top, middle, and bottom in the cabinet -- as recommended by ASHRAE. Raritan also offers SmartSensors that detect water leaks and vibrations. For security, contact closure sensors are available to monitor cabinet door openings/closings. "Like the proverbial miner's canary, Raritan's SmartSensors provide early warning alerts to potential problems, such as hot spots, that could jeopardize the performance and life of IT assets," adds Mott. Without disrupting operations, Raritan's plug-and-play SmartSensors can be installed into Raritan's PX® intelligent PDUs thereby cost effectively leveraging the existing network layer in racks provided by the PDUs. The sensors also can be deployed as plug-and-play options for Raritan's EMX rack controllers, PX inline meters, rack transfer switches, and branch circuit monitors. Removable sensor heads are available to help maintain the accuracy of the temperature/humidity sensors. Visit here to learn more about Raritan's SmartSensor – which was awarded a 2018 IoT Product of the Year Award by IoT Evolution Magazine. Legrand is a global specialist in electrical and digital building infrastructures. Its comprehensive offering of solutions for use in commercial, industrial, and residential markets makes it a benchmark for customers worldwide. Innovation for a steady flow of new products with high added value is a prime vector for growth, including, in particular, connected devices stemming from Legrand's global Eliot (Electricity and IoT) program. Legrand reported sales of $6.2 billion(USD) in 2017. Legrand has a strong presence in North and Central America, with a portfolio of well-known market brands and product lines that includes AFCO Systems, C2G, Cablofil, Chief, Da-Lite, Electrorack, Finelite, Luxul, Middle Atlantic Products, Milestone AV, Nuvo, OCL, On-Q, Ortronics, Pass & Seymour, Pinnacle, Projecta, QMotion, Quiktron, Raritan, Sanus, Server Technology, Solarfective, Vaddio, Vantage, Wattstopper, and Wiremold. Legrand is listed on Euronext Paris and is a component stock of indexes including the CAC40, FTSE4Good, MSCI World, ASPI, Corporate Oekom Rating, and DJSI (ISIN code FR0010307819) www.legrand.us.